Spin Palace Casino is one of the principal properties of The Palace Group, which has significant experience with regard to management and operation of online casinos. Established in 2001, Spin Palace Casino is powered by Microgaming software. The casino is regulated by the Lotteries and Gaming Authorities of Malta and certified by eCOGRA. The casino has a candid look and revealing homepage. The casino has a great reputation in the online casino industry. Canadians can play on the games here either instantly in their browser, from within a perfectly secure casino download client or on mobile. A broad range of more than 650 games are available from within the downloadable version of the casino. You can find Classic Slots, Video Slots, Table Games, Multi-Player Games, Live Dealer Games, Progressive Jackpot Games, Video Poker, Instant Win Games and Variety Games. Playing from within the download client also enables you to take part in daily/weekly online slot tourneys and online blackjack tourneys. The main live dealer casino games available here include Live Blackjack, Live Roulette, Live Casino Hold’em and Live Baccarat. Some of the best games here from Microgaming include Thunderstruck II, Mega Moolah, Avalon II, Immortal Romance, Major Millions and Girls with Guns-I and II. Some of the best branded titles include Game of Thrones, Terminator 2, Hitman, Tomb Raider (I and II), Jurassic Park and Battlestar Galactica. Blackjack players have over 40 different tables to choose from, while 50 different versions of Video Poker, including Deuces Wild Level-Up Poker, are here for real-CAD play. There are over 250 online slots of various Microgaming hues available to play. The full range of bonus feature slots is available at Spin Palace, like the great 100-payline Cashapillar, plus some great progressive jackpot titles like the millionaire-making Mega Moolah. Spin Palace has introduced sports betting to its game lobby where you can bet on boxing, wager on horse races, darts matches or choose the Super Bowl to play at Spin Palace. You can find Fractional Odds, Decimal Odds, and American Odds, and Markets of all kinds available to you across an extraordinary amount of different sporting and betting events. Spin Palace Sports is supported by SBTech – a multi award-winning sports betting provider and also offers great bonuses to players who bet on sports. You can grab the huge bonus and take free bet up to CA$200. Sports betting is specially launched for Canadian players and soon launching in Europe as well. As part of the prestigious Spin Palace sports betting spin-off offers the same great service, safe and secure wagering and fair results. A fully mobile optimised product, Spin Palace Sports is available to access from desktop or on the go via your mobile device. ‘GET C$1,000 FREE!’ flickers the homepage headline. The bonus, as with many bonuses this size, is split up into three deposits. The first deposit is a 100% match bonus up to C$250, while a second deposit up to C$300 is matched 25%. Finally, a bigger third deposit match bonus is available at 50% up to C$450. There are terms applied, of course, but if you can work through the first two deposit bonuses in quick time, that healthy third deposit bonus is worth the effort. For the bonus catch a wagering requirement of 50x your deposit is required in order to qualify for the bonus cash. On top of that, as with other Microgaming-powered casinos, slots play counts 100% towards the bonus amount, with that allowance dropping hugely to just 8% for poker, roulette, video poker and most blackjack games. Craps and baccarat players are out of luck, with a zero-percent eligibility towards the bonus trigger. Virtually every Canada-friendly banking method is available for making real-cash deposits any time. The usual VISA and MasterCard options are here, both in debit and credit card formats, while voucher schemes like Ukash and entropay and trusted e-Wallets like NETELLER and Skrill/Moneybookers can also be used. You can also make use of the INSTADEBIT deposit method, which exclusively lets Canadians deposit to their Spin Palace account straight from their bank debit account. Withdrawals are fast and protected so you should see your winning within 48 hours. There’s an excellent loyalty program in place at Spin Palace Canada for the casino’s loyal customers. The more you play, the more club points you earn. Hit 2,500 points and you join the ranks of Silver, with 5,000 earning you Gold status, 10,000 Platinum, 200,000 Diamond and 500,000 an entry into the Privé club. You need to maintain your gaming to hold on to your loyalty status, but regular play is rewarded with increasing bonus points, entry into exclusive tournaments and massive monthly casino bonuses. Privé players can take advantage of customised gifts for themselves and family members, as well as invites to world sporting events, faster withdrawals, and a face-to-face meet-up with the VIP manager. If you prefer to use your smartphone or tablet device then head over to Spin Palace Mobile Casino directly from your handset. You can play on the games at Spin Palace Casino in the real money mode and in the free play mode and plenty of brand new titles seem to arrive almost every month here. To access all of the Spin Palace Casino games, you’ll need to install the software onto your computer. 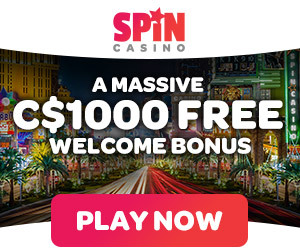 Spin Palace online casino has become the online casino of choice for countless savvy Canadian gamblers. Players can easily get hold of the support by using the Live Chat option, Skype or by filling out the online email entry form. If you have any questions or concerns about your account, Customer Support is available to help you 24/7. The service is offered in 18 different languages and can be accessed via phone or email. ← Which is the best PayPal online poker site for Canadians?